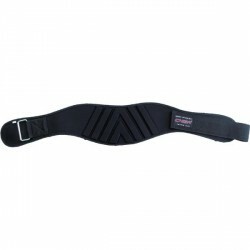 The Chiba weight lifting belt Nylon Performer offers special protection of back vertebras for strength training. The Chiba training belt Nylon Profi with large-padded back part protects the back vertebra while doing strength training. The Chiba leather weight lifting belt made of sturdy nappa leather stabilizes vertebars while doing weight lifting: an essential accessory for lifting heavy weights. Leather weight lifting belt of excellent workmanship. 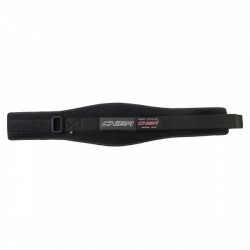 The weight lifting belt is an important accessory for all enthusiastic strength athletes. Weight lifting belts are either worn for hard loads for a competition or for training with heavy weights. Wearing a weight lifting belt increases the trunk stability and relieves the spine. The larger the belt, the stronger is the stabilizing effect and the heavier weights can be lifted. Weight lifting belts are often made of thick leather, which guarantees highest stability. We also offer weight lifting belts made of nylon, which can be worn more flexibly and more comfortably, though they do not offer the same stability like belts, made of leather, due to their softer material. Weight lifting belts are infinitely variable with a hook-and-loop fastener, providing a more precise size adjustment to the body of the user. A buckle closure is more durable and more stable for higher loads. When you purchase a weight lifting belt, mind the presence of a back pad, when it is a weight lifting belt made of leather. The reason is that lumbar vertebras are optimally supported by the pad for high loads. The back pad is of less importance for belts made of nylon, because they adapt stronger to the lower back due to the softer material.